Prepare the steamed crabs for garlic crabs. Place your hand over the backfin leg and pull away the top shell & discard it. Remove & discard the six gills, which look like spongy fingers, & then remove their entrails, using your fingers or a knife. Once clean, tear off the crab’s mouth & any sharp shells that might be protruding. Finally, break the crab in half or leave it whole (you decide). Repeat with the remaining crabs. When all the crabs are cleaned, place the crabs in the pot along with the cabbage & white wine. You can add the optional salt, pepper, butter, & parsley. Cover the stockpot & place it on a burner. Raise the heat to medium & cook the crabs until the cabbage & garlic is tender or, about 15 minutes. Chef’s Note: I love Garlic Crabs & prefer to prepare them with already steamed crabs. You can prepare this recipe with live crabs, but removing the shell is a bit cumbersome. For a tangy, sharp flavor, use raw garlic, however if you like it mild use roasted garlic instead. This is a block party favorite: hot or cold, the crabs & juices maintain their wonderful flavor. On medium heat, in a large skillet, add olive oil & minced garlic. Cook until slightly browned , add Italian seasoning & toast for 2 minutes. Add 4 cans of clams (with juice), add salt & pepper to taste. Bring to a boil, add one full can of wine (or, if you don’t want to use wine, add the juice of 1 lemon), turn down heat to a simmer. Cook pasta according to directions on the pkg. 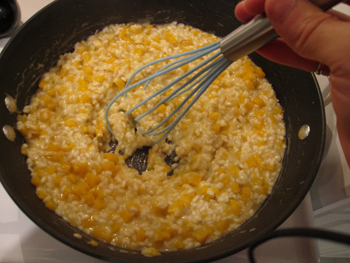 in salted water (the water should have at least 1 full tsp of salt – NO OIL). When the pasta is al dente, add pasta to the pan with clam sauce to finish cooking. 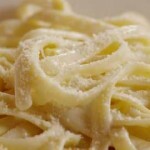 Add pasta water as needed to make a creamy sauce (you’ll need anywhere from ½ to 1½ c.). Add fresh herbs & cheese, fold together. Serve with hot crusty bread & more cheese.